The past few years, my mom has been giving my brother in law, Brendan, a Marzipan Pig for Christmas as a stocking stuffer. "A marzipan pig is a confection made of marzipan, a paste of almonds and sugar, and formed into the shape of a small pig. In Germany, Norway and Denmark, the gift of a marzipan pig at Christmas and New Year's symbolizes good luck and fortune in the year to come. 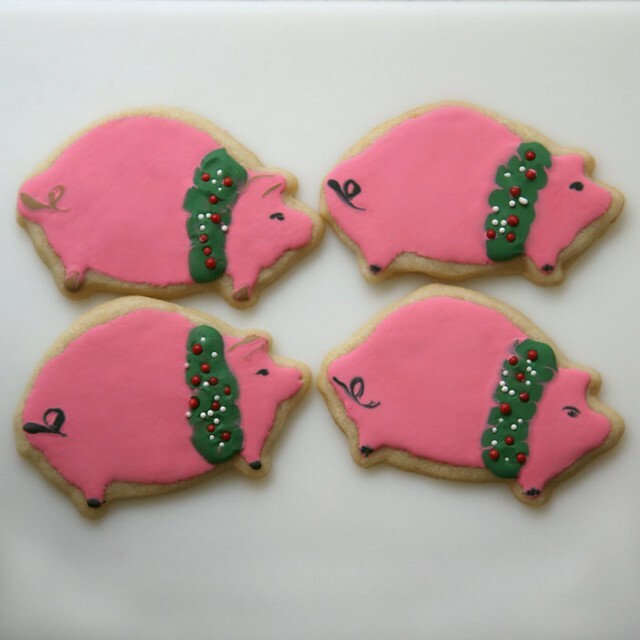 Marzipan pigs are sometimes presented with four-leaf clovers, coins or other symbols of good luck in their mouths." There is also another website that mentions a game for the children on Christmas Eve where a whole almond is hidden in the rice pudding. 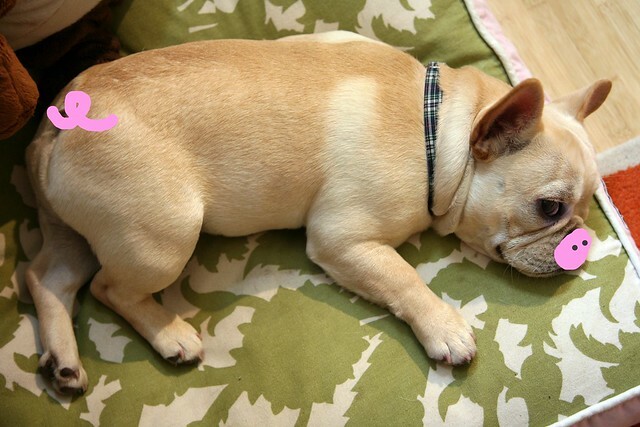 Whoever finds the almond, recieves an almond treat, such as the marzipan pig. This one sounds somewhat familiar. 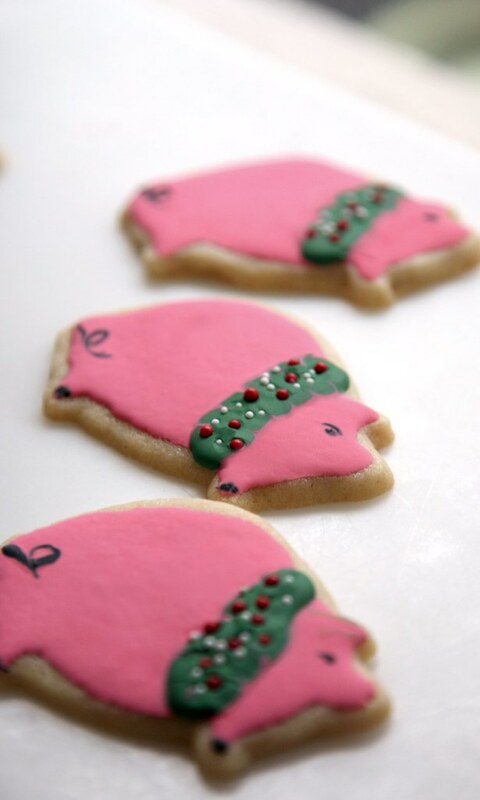 So, when I was rummaging through Vale's cookie cutters, and discovered a pig shaped cookie cutter, I was inspired to make a Christmas Pig Sugar Cookie! Why not?! I think the wreath was the perfect touch. 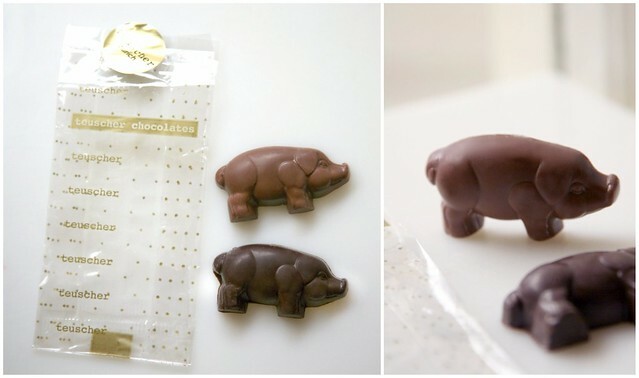 Mark, my future brother-in-law, was buying some special chocolates for Oscar's advent calendar at Teuscher (really fancy Switzerland chocolate) and he surprised me with a chocolate pig in milk and dark chocolate. Embrace the Christmas Pig, people. He does exist! 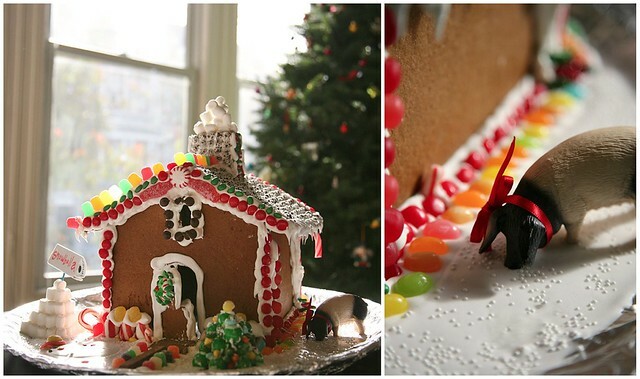 When Vicki, Vale, Oscar and I made a Gingerbread House, it was suddenly perfectly appropriate to adorn one of Oscar's toy pigs with a red bow and stick him in the royal icing "snow". 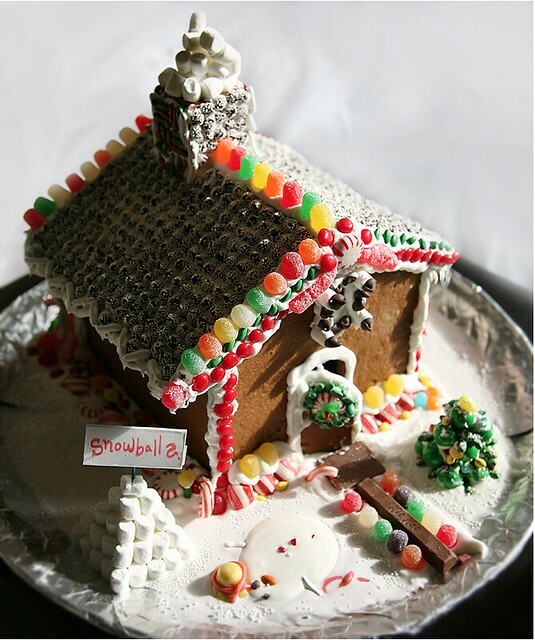 PS - Isn't our gingerbread house pretttttty? Oh, and because I couldn't discuss PIGS without thinking about my little fart-bucket.... and it's just too easy to NOT to... here's Georgia after a little boboshop magic.